1. Preheat the oven to 180°C, gas mark 4. Arrange the feta on a parchment-lined baking sheet. Drizzle with ½ tbsp olive oil, scatter over the lemon zest and a few mint leaves, season with black pepper and bake for 15 minutes (if you want the feta more charred, put under the grill for 2-3 minutes after baking). Meanwhile, cook the farro according to pack instructions, adding the peas for the last 3 minutes; drain and set aside. 2. For the dressing, place 45g pea shoots, the remaining mint and ½ tbsp olive oil, the lemon juice and yogurt in a NutriBullet or small food processor. Season and whizz until smooth. 3. Mix ½ the dressing into the warm farro and peas. Divide the mixture between 2 plates, topping with the remaining pea shoots and the baked feta. 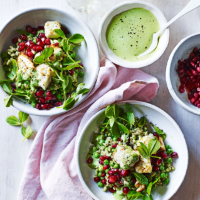 Serve with the extra dressing and a scattering of pomegranate seeds. This recipe was first published in Thu Apr 26 12:52:57 BST 2018.